When I was told to come to the Hopewell Centre for a meeting this afternoon, it did not ring a bell to me that this was the tower that housed the famous revolving bar/restaurant on the 62nd floor. The name sounded familiar from the moment I read it, but I suppose I must have completely forgotten about it until today. So, it took me nearly half an hour of wandering around Wanchai before finally identifying the 64-storey tower, which used to be the tallest tower in Hong Kong during the 1980s. As mentioned earlier, the Hopewell Centre used to be the tallest building in Hong Kong until the late 1980s. I remember coming to this tower with my parents and to the revolving restaurant (less often than going to the Victoria Peak though). I cannot clearly remember now, but I suppose the view from the restaurant must have been magnificent, as the tower looked down upon every building around it at the time. On the other hand, the view from the ground level is very different. Thanks to my earlier confusion that led me to wander around Wanchai for nearly half an hour, I was able to have a closer view of latest redevelopment projects in this part of Wanchai. 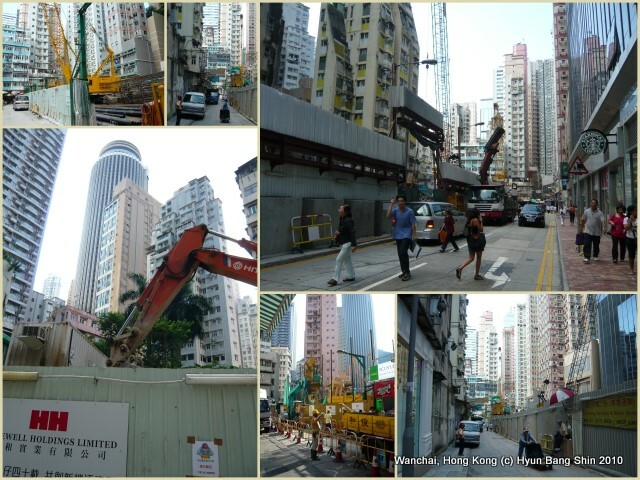 Several pockets of Wanchai’s old district are now demolished, and construction workers are laying the foundation for reconstruction. While the bird’s eye view from the top of the Hopewell Centre projects Hong Kong’s more global image, the Wanchai district within which the Hopewell Centre is located provides a rich life of Hong Kong’s ordinary residents. 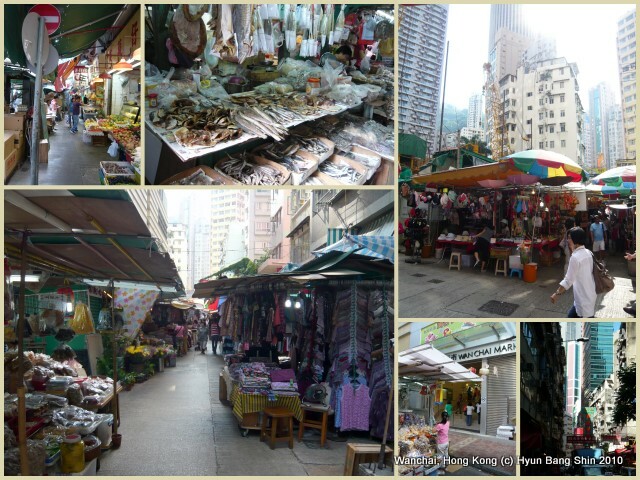 The district is home to not only many night clubs and bars, but also to street markets, vendors and specialized small firms, which are frequented by local Hong Kong residents. Visitors to Hong Kong tend to associate Hong Kong with luxury goods and duty-free shops, but what lie behind buildings, hidden from the view from main streets, are what truly enrich the time and space of Hong Kong. These endogenous characteristics seem to face a great pressure of extinction due to a series of redevelopment proposed and implemented in this district. During my one-hour walk today, it was easy to find many sites of demolition and redevelopment. Interestingly, they were mostly bearing the name of the Hopewell Holdings Limited, strongly suggesting that the property firm is behind these projects. I haven’t yet had a chance to find out the extent of the company’s involvement in these projects or their ownership/finance structure. The scale of intrusion of these projects into people’s life, however, is simply amazing and difficult to describe. Perhaps the on-going process here typifies what an urban renewal project means to local people in contemporary Hong Kong. It is difficult to argue against any kind of demolition and reconstruction when one observes the status of severe dilapidation of some of the old, poorly maintained buildings. However, when projects are largely promoted and designed by developers to meet the taste of the rich who have a very different notion of urban life, they become a serious threat to people who pursue their daily life under current use of space, which may not be the highest and best use of land from the perspective of developers. Hong Kong seen from above at the top of the Hopewell Centre is certainly different from that experienced on the ground. To me, Hong Kong is like my first love. It’s a city where I used to live for some years when I was young. Although Hong Kong has changed substantially since then, it still retains areas that are associated with my childhood memory. For instance, whenever I approach Hong Kong University campus on Bonham Road, I am always relieved to find the old apartment block still standing. It may get demolished and reconstructed someday, but for the moment, it is still there and I am happy for it. When I approach the Star Ferry on the Kowloon side, I still walk by the shopping mall that used to house my favourite electronic games centre. The Hong Kong side Star Ferry pier no longer retains its previous look, as the original one was demolished and relocated due to land reclamation. I think it was Hutchison House that used to have a bookshop where I used to buy my beloved SF novels such as those by Isaac Asimov and Arthur Clarke. At that time, it was one of the few English bookshop that sold SF novels from these authors. Asimov’s robot series was my biggest collection item at the time. Since mid-2000, I seem to come back to Hong Kong at least once a year. Somehow, I haven’t had a chance to re-visit The Victoria Peak, and today, I finally made my way. My choice of transport was the Peak Tram, which always gave me the joy of riding in the old days. Today’s tram is not the same as what it used be in the 1980s, but the steep track is not replaceable. The most disappointing part was the Peak Tower, which has become too commercial and does not retain the old shape and memory any more. 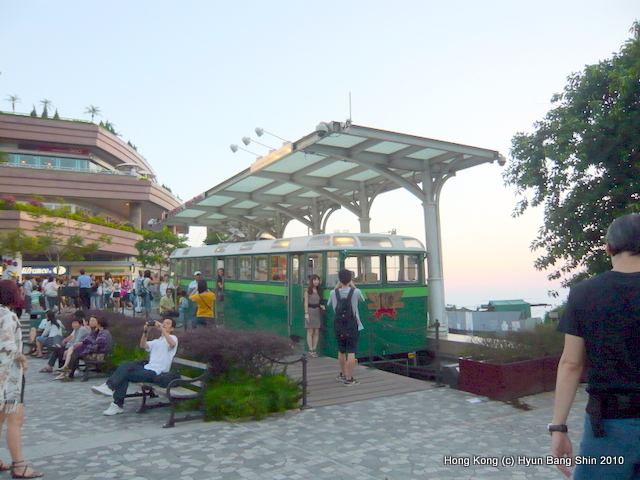 In front of the Peak Tower stands the old tram. I am not completely sure, but I think this is the same model as the one I used to ride. It was kind of funny to see this on exhibition in this way, as if my childhood is fossilised in time together with the retirement of this tram. It was already 6 pm when I arrived at the Peak, and it was getting dark. 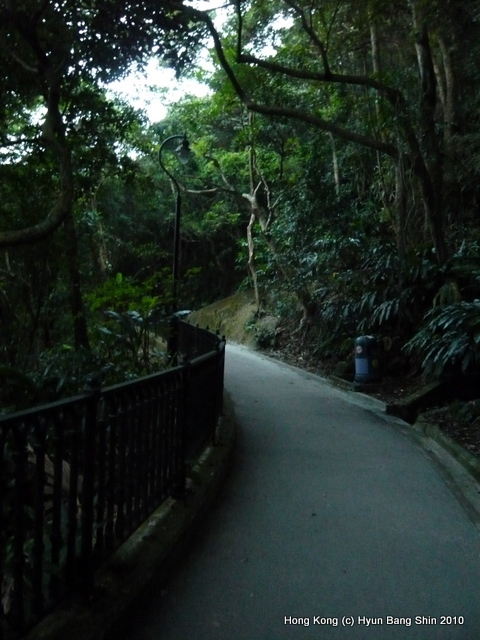 My main aim was to be able to take a short walk along the Peak Path, which was to some extent a ritual for me. My family visited the Victoria Peak frequently when we lived in Hong Kong. On Sundays, we often came here for a walk along the Peak Path, which took a little more than an hour to complete one round (or may be longer), and had late lunch before heading back home. The old Peak Tower used to have a nice restaurant that commanded a very nice view of Hong Kong. 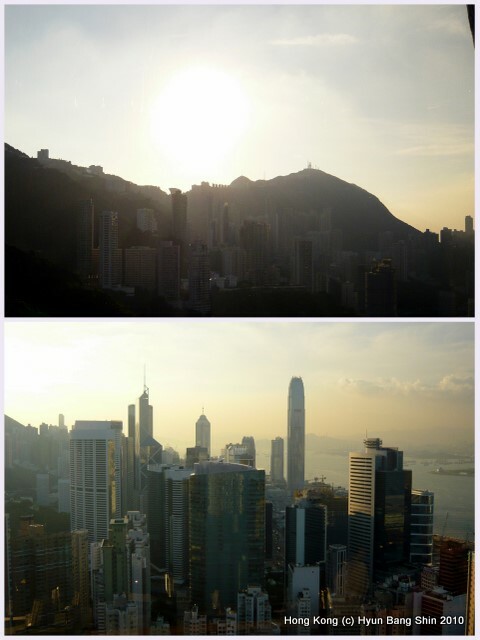 Luckily, before it got too dark, I was able to take a few pictures of Hong Kong island and Kowloon. Obviously, there are quite a few high-rises, which were constructed after I left Hong Kong, but the overall impression that Hong Kong presents has not changed until now. The high density of buildings is simply amazing and breathtaking. 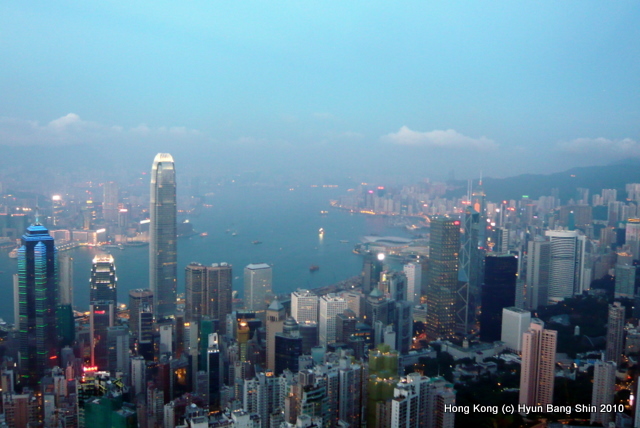 Due to the continuous land reclamation, the surface area of Hong Kong island and Kowloon seen in this picture must have increased accordingly. I must look up my old albums when I get a chance to visit Korea next time, and see if I can find any picture of 1980s Hong Kong. I am leaving Hong Kong tomorrow, but I am sure I will be longing for my return. The rise of Shanghai has been subject to academic scrutiny during last few decades. The study of Shanghai and other major coastal cities provides an window to understand China’s past, present and future, but sometimes, misdirects observers to believe that Shanghai (and a few other major coastal cities such as Guangzhou) represents China’s urbanism. As one of leading cities, what Shanghai does sets an example for other inland cities that admire Shanghai’s re-emergence as a world city. 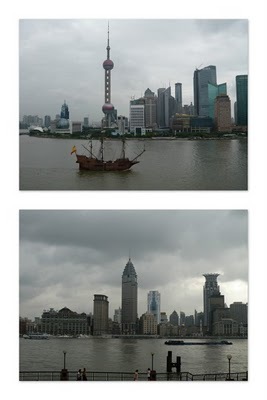 In this regard, understanding Shanghai’s urbanism is an interesting and necessary endeavour. On the other hand, it is necessary to understand China’s inland cities experience a differing degree of exposure and possession of economic, political and geographical assets (both existing and expected) that would influence the particular trajectory of their growth. Shanghai’s rise may not be something that can be easily replicated by other inland cities. Wudaoying Hutong, the next Nanluoguxiang? Nanluoguxiang in Dongcheng District of Beijing is now known as a culture district, promoted by the district government as a showcase for heritage conservation and tourist attraction. While many hutongs in Beijing’s inner city areas have disappeared due to demolition and reconstruction-oriented urban renewal strategies, some hutongs have been selectively experiencing revalorisation through upgrading (if interested in this topic, see my paper, ‘Urban Conservation and Revalorisation of Dilapidated Historic Quarters: the case of Nanluoguxiang in Beijing’). Nanluoguxiang has been one best example, with its heavy concentration of traditional Beijing residential dwellings known as hutong and its long history that goes back to the 13th century.